Even the most rock solid mountains on this planet can be shaken. The highest mountain can crumble at the blast of our Father's nostrils. Wars, rumors of wars, economic recessions, global strife, and many other things can cause even the strongest of men to tremble. Such is the kingdom of this world. It is here today and gone tomorrow. But the author of Hebrews is speaking of another kingdom that cannot be moved. This kingdom is part of our inheritance. 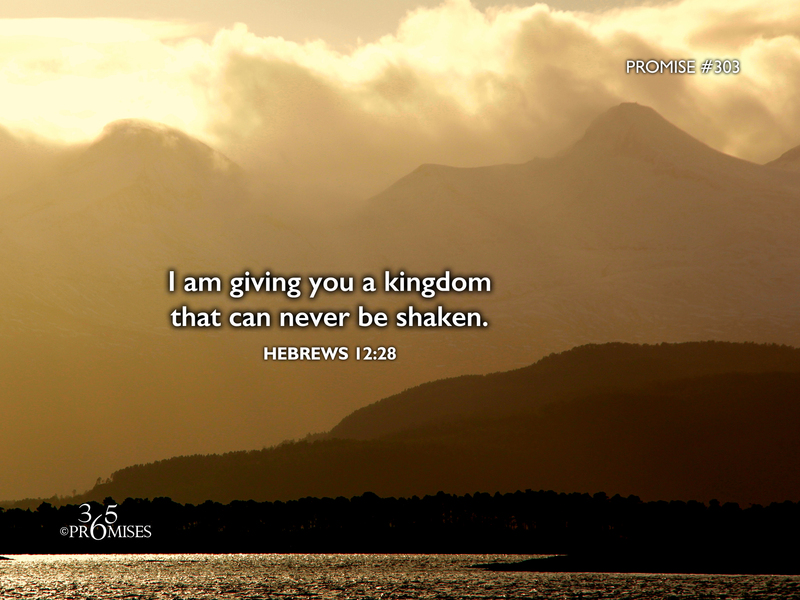 It is a kingdom that cannot be shaken. It is a kingdom that is safe and secure and beyond the influence of fallen men. It is a kingdom where the greatest will be the servant of all and its citizens, little children. We are receiving a kingdom right now that cannot be shaken. Jesus taught us to pray in the Lord's prayer (Matthew 6:9-11) ...your kingdom come, your will be done as it is in heaven. May we never take this kingdom lightly. May the fear of the Lord fill us with an ever increasing awareness of this unshakeable kingdom that we are receiving right NOW!